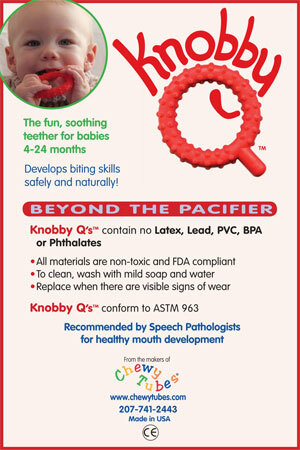 Knobby Qs encourage early mouthing experiences that support the transition from midline tongue exploration to lateral jaw movement. This transition facilitates the development of the masseter muscle so critical for mature speech production as well as biting and chewing skills. Allows an open mouth for breathing – Helpful when a child is congested or has a cold and the nose is stuffed up. Encourages tiny hands to grasp the Chewy Q and place in the mouth – Supports hand to mouth coordination and self-regulation of biting by baby. Can inhibit proper dental growth and promote a cross bite as teeth erupt.